The common cold is an infection of your nose and throat caused by viruses. We typically catch between two and four colds a year. Symptoms of the common cold, which usually appear one to three days after being exposed to a cold virus include a runny nose, cough, nasal congestion, sore throat, sneezing, watery eyes, mild headache, mild fatigue, body aches, and fever less than 102 degrees. Here is a look at 11 of the more popular natural remedies for the prevention and treatment of the common cold. 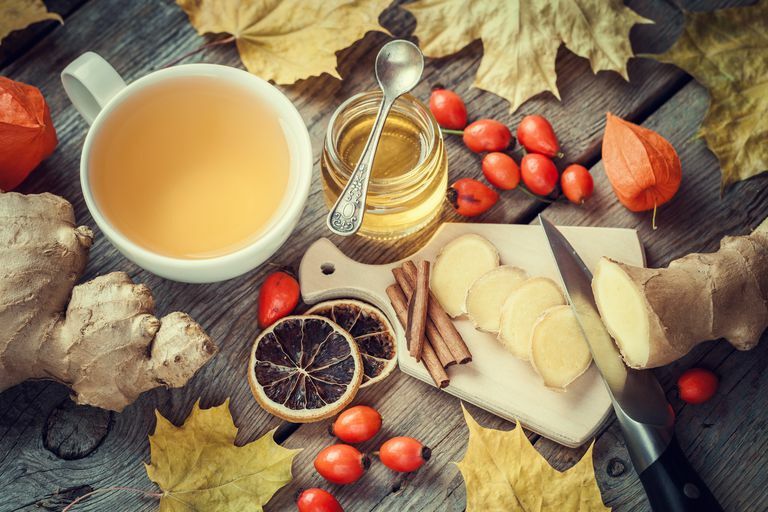 In addition to these remedies, certain foods may also help to boost the immune system and additional remedies may be recommended for cough relief and post-nasal drip. Keep in mind that scientific support for the claim that any remedy can treat colds is lacking and that alternative medicine should not be used as a substitute for standard care. If you're considering the use of any remedy for a cold, make sure to consult your physician first. Zinc is an essential mineral that is required by more than 300 enzymes in our bodies. It’s found naturally in foods such as meat, liver, seafood, and eggs. The full recommended daily allowance (RDA) is 12mg for women and 15mg for men, an amount found in a typical multivitamin. Zinc lozenges are often found in health stores, online, and in some drug stores marketed as cold remedies. A number of studies have found that zinc helped to reduce the duration of cold symptoms, especially if people started taking it within 24 hours after cold symptoms appear. Zinc also reduced the severity of symptoms and decreased the duration of symptoms by three to four days. The problem is that many of these zinc studies have had flaws, so better-quality studies are needed. Zinc lozenges may work by blocking the cold virus from replicating (preventing it from spreading) or by impairing the ability of the cold virus to enter cells in the nose and throat. The zinc lozenges used in the studies contained a minimum of 13.3mg of elemental zinc. The lozenges were taken every two hours during the day, starting immediately after the onset of cold symptoms. The studies that found zinc to be ineffective may have used a dose of zinc that was too low or had taste-enhancing compounds known to decrease the effectiveness of zinc, such as citric acid (found in citrus fruit), tartaric acid, sorbitol, or mannitol. Zinc lozenges usually contain either zinc gluconate or zinc acetate, providing 13.3mg of elemental zinc in each lozenge. It's typically recommended that people take one lozenge every two to four hours during the day for a maximum of six to 12 lozenges a day. Side effects of zinc may include nausea and an unpleasant taste in the mouth. Zinc lozenges are not recommended to prevent colds or for long-term use, because zinc supplements in excess of 15mg per day may interfere with the absorption of the mineral copper and result in a copper deficiency. There is some evidence suggesting that people with higher levels of vitamin D may have a reduced risk of catching a common cold. Read more about vitamin D and the common cold. Astragalus root has long been used in traditional Chinese medicine to strengthen immunity and prevent colds and flu. Studies have found that astragalus has antiviral properties and stimulates the immune system, although there have been no clinical trials examining the effectiveness of astragalus against colds in humans. Astragalus is also an antioxidant and has been suggested for conditions such as heart disease. It's being investigated as a possible herbal treatment for people with health conditions that weaken their immune systems. Astragalus can be found in capsule, tea, or extract form at health food stores or as a dried root in Chinese herbal shops and some health food stores. The dried root can be difficult to find. Traditional Chinese medicine practitioners usually recommend taking astragulus to prevent colds and to avoid it if you're already sick. A bowl of soup boiled with astragalus root is often recommended once or more per week throughout the winter to prevent colds. Astragalus may increase the potency of antiviral medications such as acyclovir or interferon, thereby worsening the potential side effects of these drugs (such as possible kidney failure and other side effects). It could also possibly counteract immune-suppressing drugs such as cyclophosphamide (Cytoxan, Neosar) or corticosteroids. It may lower blood glucose or blood pressure, increasing the effects of blood pressure or diabetes medications. Garlic is one of the more popular home cures for colds. Many cultures have a home remedy for the cold using garlic, whether it’s chicken soup with lots of garlic, a drink made with raw crushed garlic, or if it just involves eating raw garlic. The cold-fighting compound in garlic is thought to be allicin, which has demonstrated antibacterial and antifungal properties. Allicin is what gives garlic its distinctive hot flavor. To maximize the amount of allicin, fresh garlic should be chopped or crushed, and it should be raw. It’s also available in pill form. In one study involving 146 people, participants received either a garlic supplement or a placebo for 12 weeks between November and February. People who took garlic reduced the risk of catching a cold by more than half. The study also found that garlic reduced the recovery time in people who caught a cold. More research is needed to corroborate these results. Garlic does have some possible side effects and safety concerns. Bad breath and body odor are perhaps the most common side effects; however, dizziness, sweating, headache, fever, chills, and runny nose have also been reported. Large amounts may irritate the mouth or result in indigestion. Garlic supplements should be avoided by people with bleeding disorders, two weeks before or after surgery, or by those taking "blood-thinning" medications such as warfarin (Coumadin) or supplements believed to affect blood clotting such as vitamin E, garlic, or ginkgo. Garlic may also lower blood glucose levels and increase the release of insulin, so it should be used with caution by people taking drugs that lower blood sugar. People with allergies to plants in the lily family (including onion, leeks, and chives) should avoid garlic. Pregnant women should avoid garlic in supplement form because it may increase the risk of bleeding. More about garlic for colds. In 1968, Linus Pauling, PhD, proposed the theory that people had individual requirements for various vitamins and some needed amounts higher than the recommended dietary allowances (RDAs). Pauling proposed that 1,000mg of vitamin C daily could reduce the incidence of colds for most people. Since then, vitamin C has become a popular cold remedy. A review by the Cochrane Collaboration examined whether vitamin C supplements in doses of 200mg or more a day could reduce the incidence, duration, or severity of the common cold. The researchers analyzed 30 previously published studies (involving a total of 11,350 participants) that met their quality criteria. They found that vitamin C didn’t appear to prevent the common cold. There was a slight reduction in the length and severity of cold symptoms. It appeared to markedly reduce the risk of catching a cold in people involved brief, intense physical activity (such as marathon running or skiing), or in those exposed to cold temperatures. Vitamin C in amounts over 2,000mg may cause diarrhea, loose stools, and gas. Honey is a popular home remedy for cough and colds in many cultures. A new study in the Archives of Pediatrics and Adolescent Medicine provides the first evidence showing that honey may help to calm children's coughs and help them sleep better. Researchers gave 105 children with colds either honey, honey-flavored cough medicine, or no treatment. All of the children got better, but honey consistently scored best in parents' rating of their children's cough symptoms. The researchers say that honey may work by coating and soothing an irritated throat and it’s believed to have antioxidant and antibacterial effects. Dark-colored honey, such as the buckwheat honey used in the study, is particularly high in antioxidants. Honey isn't recommended for infants younger than 1 year because of the risk of botulism. Regular use of honey at night may also promote cavities developing. Although recent findings question the use of echinacea for colds and flu, it’s still one of the most popular herbs used today. A 2005 study by the National Center for Complementary and Alternative Medicine found that echinacea did little to prevent or shorten the common cold. There were many critics of the study, who say that the study shouldn't be used as evidence that echinacea doesn't work. The Cochrane Collaboration conducted a review of 15 studies on echinacea, however, and found that it wasn't more effective than a placebo at preventing colds. Although there are several types of echinacea, the above-ground parts (the leaves, flowers, and stems) of echinacea purpurea have been subject to the most research. Herbalists often recommend taking echinacea every two to three hours with a total daily dose of three or more grams per day at the first sign of symptoms. After several days, the dose is usually reduced and continued for the following week. Echinacea is also an ingredient in Airborne, a supplement containing vitamins and herbs sold over the counter. Although there are many types of ginseng, one cultivated in North America called Panax quinquefolius or “North American ginseng" has become popular as a remedy for colds and flu. Compounds called polysaccharides and ginsenosides are thought to be the active constituents in ginseng. One of the more popular ginseng products is Cold-fX. Two studies tested Cold-fX in 198 nursing home residents, who received either Cold-fX or a placebo. There was no statistically significant difference in the number of people who contracted the flu and no difference in the severity or duration of the flu. The researchers analyzed the results of the two studies together and only then did the results show that Cold-fX reduced the incidence of the flu. Although it's popular and some people swear by it, large, well-designed, independent trials are needed to determine the safety and effectiveness of this product. There is some concern that ginseng may reduce the effectiveness of "blood-thinning" (anticlotting or antiplatelet) drugs such as warfarin (Coumadin) or aspirin. It may interact with diabetes medications, antidepressants known as MAO inhibitors, antipsychotic drugs (e.g., chlorpromazine (Thorazine), fluphenazine (Prolixin), olanzapine (Zyprexa)), drugs that stimulate the central nervous system (used to treat conditions such as attention deficit hyperactivity disorder, narcolepsy, obesity, and heart conditions) and estrogen replacement therapy or oral contraceptives. Ginseng root is thought to have estrogen-like properties and is usually not recommended for people with hormone-related conditions such as uterine fibroids, endometriosis, and cancers of the breast, ovaries, uterus or prostate. People with heart conditions, schizophrenia or diabetes also shouldn’t take ginseng root unless under a doctor’s supervision. The manufacturer of Cold-fX indicates on their website that because their product isn't a whole plant extract but contains a certain compound found in ginseng, it doesn't have the side effects and safety concerns commonly associated with ginseng; although that's possible, there isn't published safety data confirming these claims. Ginger root is another folk remedy for a cough, colds, and sore throat. It's used in traditional Chinese medicine to treat coughs and is also for colds accompanied by a runny nose with a clear nasal discharge, headache, neck and shoulder aches, and a white tongue coating. In Ayurveda, the traditional medicine of India, ginger is also used for coughing and colds. Hot ginger tea is a popular home remedy for cold symptoms and sore throat. Honey and lemon are sometimes added. Although normal amounts of ginger in food rarely causes side effects, excessive amounts may cause heartburn and indigestion. People with gallstones, bleeding disorders and those taking "blood-thinning" (anticlotting and antiplatelet) medications such as aspirin and warfarin (Coumadin) should consult a doctor before taking ginger. Ginger should be avoided two weeks before or after surgery. Elderberry (Sambucus nigra) is a herb that has a long history of use as a folk remedy for colds, sinus infections, and the flu. In preliminary lab studies, elderberry extracts have been found to fight off viruses. There has been limited research done and much of it involves the flu virus. Researchers believe that anthocyanins, compounds found naturally in elderberries, may be the active component that strengthens the immune system and blocks the flu virus from sticking to our cells. Health food stores carry elderberry juice, syrup, and capsules. Side effects, although rare, may include mild indigestion or allergic reactions. Only commercially prepared extracts of the berry should be used, because the fresh leaves, flowers, bark, young buds, unripe berries, and roots contain cyanide and could potentially result in cyanide poisoning. Read more about elderberry for the immune system. A steam inhalation with eucalyptus oil may help to alleviate symptoms from colds and flu. It is thought to work by thinning mucus in the respiratory tract. Find out how to do a eucalyptus steam inhalation. Linde K, Barrett B, Wolkart K, Bauer R, Melchart D. Echinacea for preventing and treating the common cold. Cochrane Database Syst Rev. 1 (2006): CD000530. Predy GN, Goel V, Lovlin R, Donner A, Stitt L, Basu TK. Efficacy of an extract of North American ginseng containing poly-furanosyl-pyranosyl-saccharides for preventing upper respiratory tract infections: a randomized controlled trial. CMAJ.173.9 (2005): 1043-1048. Silk R, LeFante C. Safety of zinc gluconate glycine (Cold-Eeze) in a geriatric population: a randomized, placebo-controlled, double-blind trial. Am J Ther. 12.6 (2005): 612-617. Zakay-Rones Z, Thom E, Wollan T, Wadstein J. Randomized study of the efficacy and safety of oral elderberry extract in the treatment of influenza A and B virus infections. J Int Med Res. 32.2 (2004): 132-140. Can Ginseng Help Fight Off Colds?